Paperboy is less about being a paperboy, as such, than it is about papering over the cracks that always exist beneath the surface of our lives, however much we attempt to ignore or gloss over them. It is about the superficial pleasures that we desire and need to maintain progressive, close-to-heart dreams in a sea of painful, equally close-to-heart realities. For that reason, its tone and tempo can't be anything but joyous and energetic, albeit with touches of the magical, macabre and mischievous. But sure, what else would you expect from the pen of Andrew "Borderland" Doyle and the musical mind of Peter "Duke Special" Wilson, both reuniting with Belfast's Lyric and the Youth Musical Theatre UK to adapt Tony Macaulay's memoirs with the same hyperactive, breezy dexterity that characterised last year’s Gulliver's Travels. Which is necessary in capturing a time, city and situation defined by, in Macaulay's words, innocence, a longing for peace and hope during the darkest of days. Those would be in 1970s Belfast, Shankill to be precise, where you always got caught up in violence whether you tried to avoid it or not. It's troublesome but not terminal for the desires of our Tony, played with stocky determination by a vibrant, charismatic Sam Gibson. For him, family support and his first part-time job, as a (yes) paperboy, are key to wish fulfilment: learning how to be a musician, playing on stage with the Bay City Rollers and winning the heart of Sharon Burgess (Erin Ryder). All of this is nothing that we children of the eighties, or even nineties, won't attest to: teenage dreams are hard to beat even among the bad vibrations of the wider world. 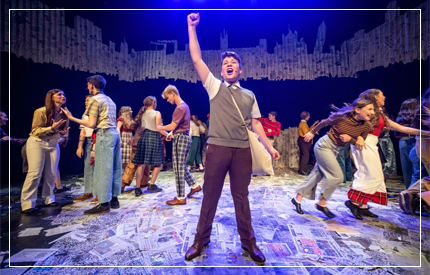 And what makes Paperboy successful is how well co-directors Dean Johnson and Steven Dexter, aided by sparkling Jennifer Rooney choreography and unique set design from Natalia Alvarez, balance the fantasy and reality alongside frantic pacing. Doors, seats and the Belfast skyline are wrapped up in newspaper, wittily visualising a scenario where the topical news of the day draws a veil over the worrying cracks in the foundations of everyday life. Paperboy is as much a sea of pop culture as it is a sea of politics, the puppetry which briefly and amusingly brings Harold Wilson and Ian Paisley to life contrasting nicely, and weirdly, with the presence of Cybermen, CS Lewis' Mr Tumnus and Tom Baker's Doctor. This surrealism extends to a dream sequence loaded with aliens, monsters, droids, robots and orbiting moons. Much less bizarre, but no less impressive, are a classroom history lesson that evolves into song and dance, a touching solo from Honor Brigg as Tony's mother, and the subplot involving Tony's rather crassly named band. All of this is a lot, arguably too much, to take in on a single viewing, but Doyle's script and lyrics, Wilson's music, and the cast of thirty-five never miss a beat in their drive to entertain. Throughout, Gibson establishes himself as a star in the making. He is the heart and mind of the piece. A piece which reminds us all that as optimistic as we permit ourselves to be on either side of the Lagan, Foyle, Westlink and so on, there were and still are holes to be filled and messes to be tidied in the fabric of Northern Ireland. And while Paperboy is smart enough to play these down in the name of general fun, it is also wise enough to raise them in the name of reality. Because wherever or however you grew up, or whatever age you are, the hurt and the hope never leaves you. Paperboy ran at Belfast's Lyric Theatre.